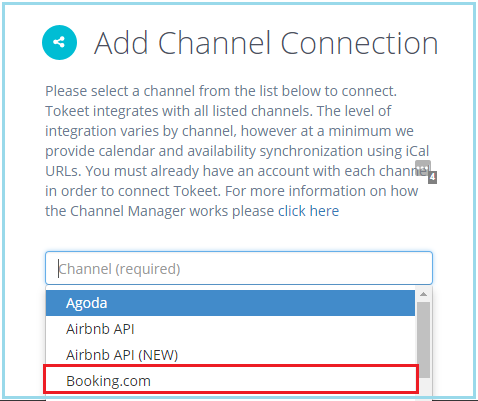 There are two steps in connecting your Booking.com property to Tokeet. 1. In Booking.com Extranet: please make sure Tokeet is permissioned as the Channel Manager. These steps are described in detail below. 2. In Tokeet: please make sure to link a Tokeet Rental, Import Bookings, Push Rates, and Push Availability. These steps are described in detail at this article. 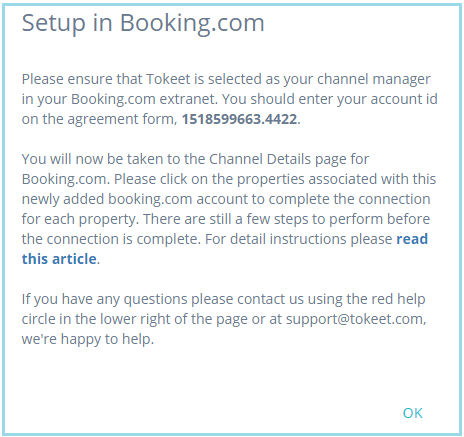 Here are the steps for permissioning Tokeet as your Channel Manager in the Booking.com Extranet. 1. 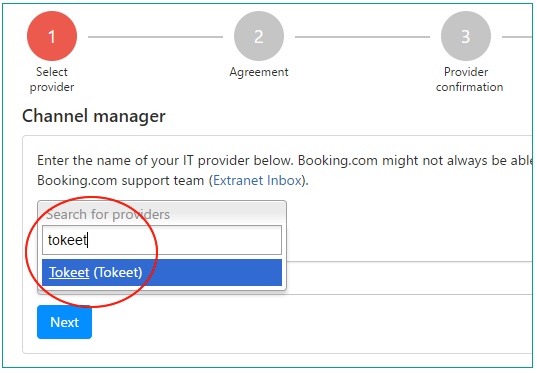 Log into the Booking.com Extranet at https://admin.booking.com using your existing credentials. Drill into a specific Property. 2. 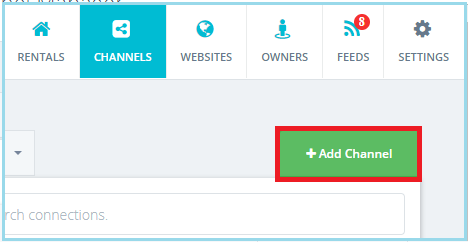 Click on the Account button at the top right, then click on the Channel Manager link in the drop-down menu. 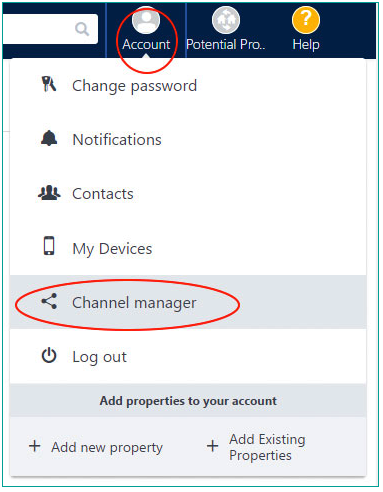 If you don't see the Channel Manager link then please contact your Booking.com support team to request the commercial approval and make sure the sign up tool in your extranet is activated. 3. On the next screen, click on the Start button to search for Tokeet in the provider list. 4. In the Search for providers field, type Tokeet and then select the Tokeet option which appears. 5. You will be making a full, two-way connection with Tokeet. Which means that Tokeet will handle availability, rates, and reservation synchronization. Click the Next button to proceed. 6. Enter your Tokeet account id or the email address your signed up with in the last field on the form. You can find your account id in Tokeet at Settings > Account Info > Your Account Info. 7. 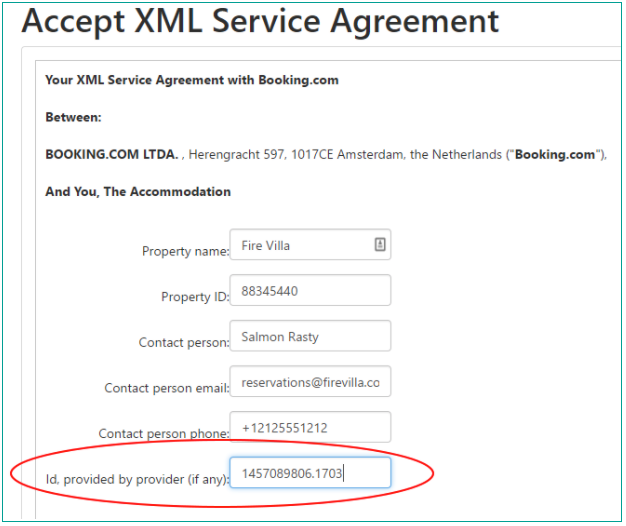 You need to accept the terms of the agreement between you and Booking.com regarding this XML connection. 8. 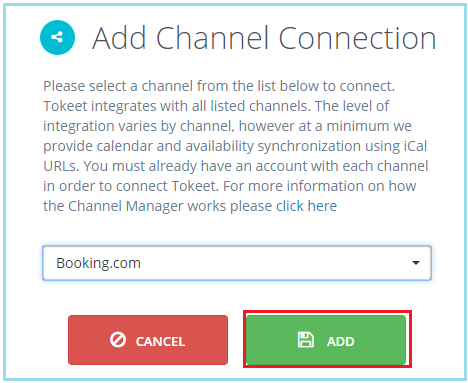 Tokeet will now receive an email message from Booking.com stating your desire to connect. 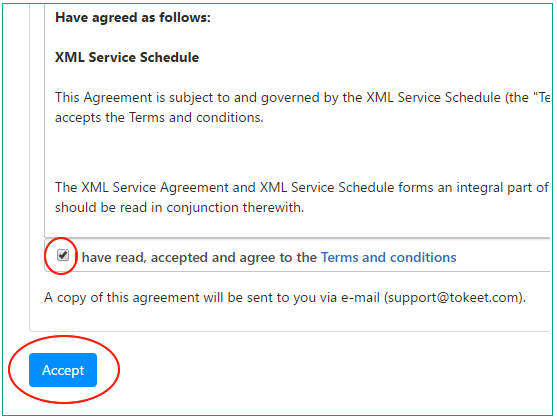 Tokeet will confirm the connection in what's called a Provider Confirmation in Booking.com. 9. 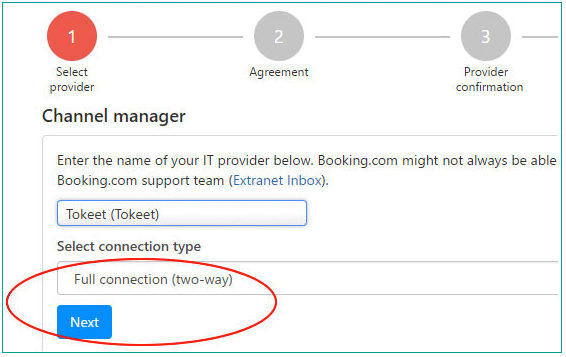 You will now receive an email message from Booking.com asking that you log back into the Booking.com Extranet and confirm the connection. Click the blue button "I confirm the connection with provider Tokeet." Your connection to Tokeet will now be active. 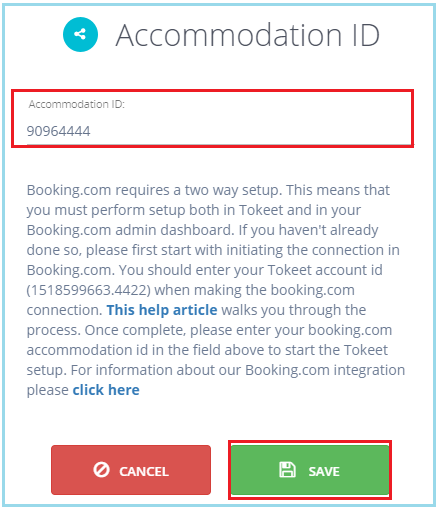 There are a number of best practices and things to consider when you connect your Booking.com account to Tokeet. You can simply follow Tokeet's Booking.com wizard, which provides a status of completion of each step. Once each step is completed, a green checkmark is shown to the left of the step. * Your Booking.com connection will not be complete until all 6 steps are completed. 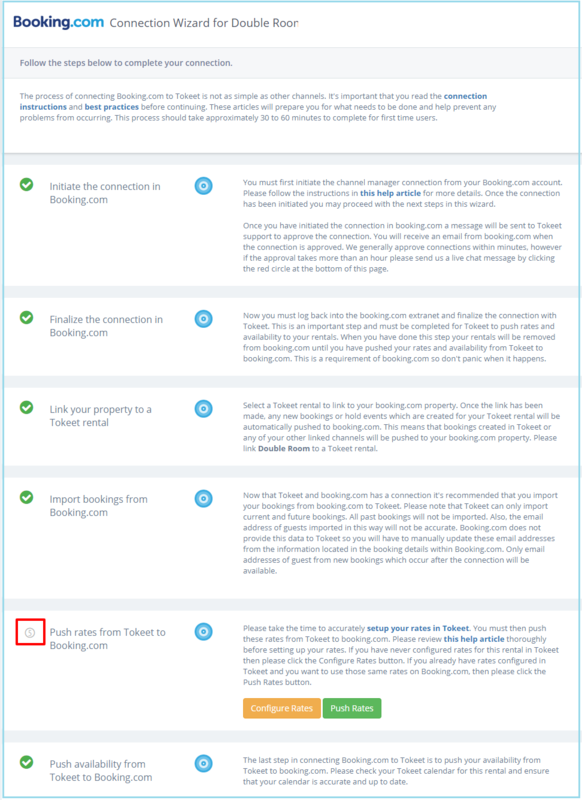 Your property will be closed / unbookable on Booking.com until you complete the connection process in Tokeet. To complete the connection process, you must link a rental, import bookings, push rental rates, and push availability. Please see this Help Center article for a detailed description. Your connection will not function properly until these steps are completed. Once the connection is completed, all updates of Rates, Availabilities and Restrictions need to be sent to Booking.com exclusively via Tokeet. Manual entries will no longer be possible via the Booking.com Extranet. 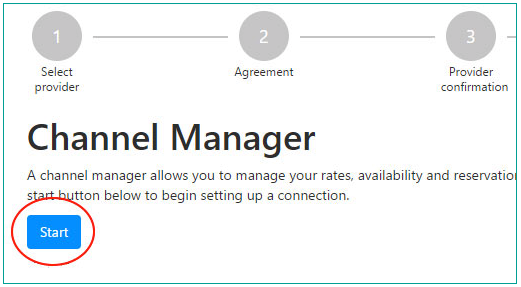 Rates & Availability grids will be visible in the extranet for you to view and monitor, however rates and availability updates will be sent by Tokeet via your dashboard. Reservations, Modifications and Cancellations will be re-transmitted to the hotel via the Tokeet dashboard. However, it is the responsibility of the hotel to always keep track of the Booking.com Extranet to monitor the status of each booking generated online.